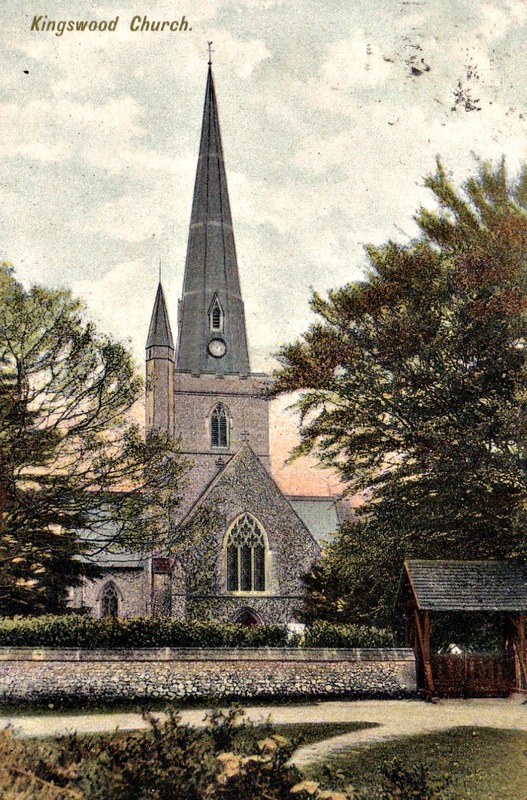 This postcard of St Andrew’s Church, Kingswood, is postmarked 15 July 1909 and is addressed to Miss Jessie Browning of Queens Street Place, Louth, Lincolnshire. Building work on the church started in 1848 and was completed in 1852 at a cost of between £8,000 and £10,000. The spire was added two years later, although it’s not clear why this was left out at the time – it certainly wasn’t a question of money. A ring of six bells, dated 1852 and bearing the name of the master founders Charles and George Mears, was cast by the Whitechapel Bell Foundry. Even today, these bells are acknowledged to be one of the finest peals in Surrey. Could Peter mean "a peal" ?? Reply from LNW: Peter does not normally get things like that wrong but on this occasion he may have done. As far as I can tell, the verb can be used in the plural but the noun (singular) refers to the sound made by multiple bells. I will ask my guru on such things - Mike Shackel. I am of the opinion that ‘peals’ in this context is fine. We are talking about a geographically placed series of bells, each having a peal of its own – the plural is expressing the mass of these. It may help to think of peals of laughter ringing out (during one of Boris’s speeches perhaps) or maybe a peal of laughter from Teresa May. I think if I wanted to be pedantic I would have said “. . . finest of peals . . . “, i.e. 'finest of many peals' which just slightly better sets the scene. Well… that’s all very interesting, isn’t it? I’m not sure whether the original comment refers to my use of “a ring of bells” at the beginning of the third paragraph, or “one of the finest peals” a sentence later. So far as I’m aware, a "ring of bells" is the definition of a set of bells hung for ringing. Whereas a “peal of bells” (according to the Oxford Dictionary) refers to “a series of changes or permutations, strictly no fewer than 5,000”, in bell ringing. So a ring is the noun, a peal is the verb. Oxford says ‘peal’(of bells) is a noun. Webster says: peal, n. 1. Bell Ringing. a Loosely, a set of bells tuned to the major scale for change ringing. b A complete set of changes on a given number of bells; esp., the series on seven bells. c Any shorter performance than a full set of changes; as, a wedding peal. Take your pick, but I think we have to accept that ‘peal' is a noun. On that basis we do, yes. The anonymous comment (2nd?) is correct as far as ringing terminology goes. When we ring a peal, it's >5000 changes - normally about 5040 changes, which takes three hours. A quarter peal is about 1260 changes, taking about 45-50 minutes. A "Ring of bells" is the name bell ringers give to a set of bells hung for English full circle ringing. The term "peal of bells" is often erroneously used, but a peal refers to a change ringing performance of more than about 5,000 changes. Bear in mind that English full-circle ringing is prevalent only in areas that have been influenced by the English - there's other types of ringing, and I'd imagine that definitions vary. So I'd be very wary about the quote from Webster - being the American dictionary. We know that the American's have butchered the English language! You won't find the English way of ringing in Germany. However, I think that there are a number of American towers that ring the English way.